This article is about the various versions of the television series Cash Cab. For the U.S. version, see Cash Cab (U.S. game show). Cash Cab is a TV game show devised by Adam Wood that originated in the United Kingdom and has been licensed to television networks in numerous other countries. Passengers in a specially outfitted taxi cab are surprised and offered the chance to win money by correctly answering a series of general knowledge or trivia questions on the way to their destination. The American version of Cash Cab has comedian Ben Bailey as host, while the Australian version features James Kerley, and the Canadian version features Adam Growe. The Australian version is currently airing its fourth season. James Kerley has been the host of the series, except for the third season, where he was replaced by Charlie Pickering. The first two seasons of the series were filmed in Melbourne, with the third being based in Perth and the fourth being currently based in the Gold Coast. The programme airs on the Australian subscription television music channel, Channel [V]. Contestants are asked several music trivia questions in various verbal, audio and video based questions for the duration of their trip. After being asked 5 questions are asked to choose The Loot or the Boot. Contestants have the opportunity to keep "the loot" they have won so far or give up all of what they have won so far, depending on how many questions they answered correctly, for what is "in the boot". Boot prizes may be worth substantially more than their sacrifice or substantially less than their current winnings and by choosing "the boot" the contestant's winnings are reset to $0 and the prize is theirs to keep, even if they use up their three strikes. On rare occasions the host may give an opportunity to the contestant to win some of their money back by doing a 30-second dare relating to their substantially less valuable "boot" prize. Contestants are entitled to 2 "Life Lines", one 30 second phone call to a friend in their phone (a "Mobile Shout-Out") or to ask someone random off the street (a "Street Shout-Out") that they are travelling on. When contestants reach their destination, they are asked if they want to "Double or Nothing" in which they can choose to walk away with what cash they have won, or to sit and watch a music video clip be asked an observation based question, and if they correctly answer, they walk away with double the winnings of the trip or if they get it wrong, they walk away with nothing. The Canadian version is produced by Castlewood Productions and began airing on September 10, 2008 on Discovery Channel (Canada) and Discovery HD, hosted by comedian Adam Growe. Filming on the second season was recently completed, with 26 new episodes that premiered in September 2009. It airs in Canada instead of the American version of the series, which airs on the affiliated US Discovery Channel network. The Canadian version closely mirrors the structure of its US counterpart, retaining familiar features like "Shout Outs", "Red Light Challenges", and the "double or nothing" Video Bonus option at the end of each game. Where the Canadian version differs is in its heavier focus on questions of science, technology, nature and adventure, as opposed to purely general knowledge. Regular questions are worth $25, $50, $100; while Red Light Challenge questions are worth $75. In the second season, a third "life line" was added....when contestants reach the $100 questions, they have the option to "swap out" a question, and the Cash Cab dispatcher will give them a new question. The Canadian Cash Cab uses eight high definition cameras: five different angles within the cab, two mounted on the roof, and one mobile camera that records on the street or from the follow van. It is also the first Cash Cab format to be taped and broadcast entirely in High Definition. The first two seasons were filmed in Downtown Toronto. Following the success of the first season, Canada's host Adam Growe was invited to host a special season premiere episode of Cash Cab (U.S.) on December 23, 2008, which promoted the feature film Frost/Nixon. In Summer 2009, Cash Cab is broadcast in a programming block with Qubit. A French Canadian version is also aired on V(formerly known as TQS) and is filmed in Montreal. In the UK the programme is made by Lion TV and was originally shown on ITV beginning in the summer of 2005. Episodes of the show aired on Challenge from 2007 until 2008. The show's host initially poses as an ordinary taxi driver and drives around the major cities of the United Kingdom in a cab. The show pays its passengers for correctly answering standard general knowledge questions. Contestants are recruited in advance but are not told that the quiz will be taking place in the cab, so although the "pick-ups" are not as random as they appear on screen, the contestants are genuinely surprised when the taxi turns out to be the Cash Cab. The contestants tell the driver their destination before getting into the taxi and are not allowed to change it. They then have the distance they need to travel to answer questions. The first five questions are relatively easy and worth £10 each, the next five are a little harder and worth £50, the next seven, even harder and worth £100, and any question after that is worth £500. If the contestant gets three questions wrong, they lose the money they have won up to that point and must leave the cab immediately. 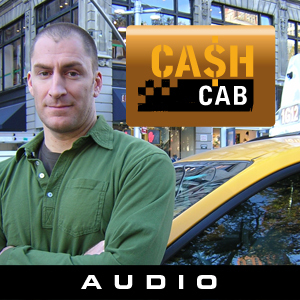 The host of Cash Cab, John Moody, is a genuine qualified taxi driver, and has an easygoing presenting style. The United States' version of Cash Cab (stylized as CA$H CAB) airs on the Discovery Channel, and is hosted by comedian and licensed New York cab driver Ben Bailey. The cab takes passengers as normal fares, and once they agree to play the driver asks a series of questions of increasing difficulty and cash value. The catch is: every incorrect answer equals a "strike," and if contestants get three questions wrong and that's three strikes at any point during the trip they are out of the game, at which point the cab driver pulls over and kick the contestants out on the spot right where they are, and they lose all the money they have won to that point. Contestants are given two "shout-outs," in which they can ask for help to answer a question, either by placing a mobile phone call or by asking a passerby on the street. Contestants can earn an additional $250 ($500 in "Double Ride" games) in a "Red Light Challenge" if the cab stops at a traffic light after they have earned at least $200 or more. To win the challenge, contestants must provide multiple answers to the question within 30 seconds; on the Red Light Challenge, there is no penalty for an incorrect answer. If time runs out after 30 seconds during the Red Light Challenge contestants don't receive a strike and they don't lose any money for an incorrect answer, and $250 ($500 in "Double Ride" games) will not be awarded. Upon arriving at the contestants' destination with fewer than three strikes, the driver offers contestants a choice: either take the prize money that they have won in the game and leave the cab or they can stick around and risk it all by answering a single "Video Bonus" question for double or nothing. If the contestants chose to risk it all, the cab driver will play a video clip for the contestants and then ask one single question based on the video clip. If they go for the "Video Bonus" question and give a correct answer, they have doubled their prize money and leave the cab with that money that they just won in the game. However, if they go for "Video Bonus" question and give an incorrect answer, they leave the cab with nothing but a free cab ride. Early on in 2007, the U.S. version also had a spinoff called Cash Cab: After Dark, in which the original dollar amounts ($25, $50, and $100) were doubled to $50, $100, and $200, the contestants were picked up around sunset, and the questions were generally more difficult than the daytime version. Starting with Season 3 in 2008, the daytime version started using the payouts from Cash Cab: After Dark. In 2009, the show added a new variation called the "Double Ride". In this variation, at random, the rider's questions' payouts are doubled to $100, $200, and $400. At the same time, the difficulty of the questions does not increase. The show's tagline is "There are 13,000 cabs in New York City, but there's only one that pays you!" The show airs on Kabel 1 in Germany as Quiz Taxi, and has been successful enough to merit a spin-off version of the show in which celebrities play the game. In Norway, it has been commissioned as a prime time show. A second season was recently commissioned in Hungary (Viasat 3). The show has aired in Lithuania (LNK), and in the Czech Republic (Czech TV). Mexico's Televisa launched their own version of the show called Taxi Cash on January 28, 2008 on Canal 4 (Channel 4). The Italian version was launched on April 27, 2009 on SKY Uno. The Greek version, called "Taxi Girl" was first aired in 2008 on the "Mega Channel" private network. The Quebec version, called "Taxi payant", was launched on September 3, 2009 on V.
^ "Cash Cab logo". http://monsterscifishow.files.wordpress.com/2007/08/cashcab.jpg.